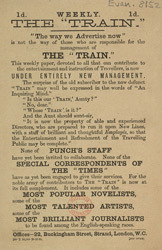 'The Train', which is featured on this leaflet, is an example of a publication that was very popular during the Victorian period. They were published on a weekly basis and contained easy to read articles and stoires. Artists were commissioned to create vivid and colourful designs for the front covers and this combined with low prices made these publications popular with the new class of travelling and commuting public. This example cost just 1 penny and was distributed weekly.